Christmas is all about family. Certainly it is about giving and being nice to each other. It is the celebration of God’s son’s birth on the earth. And while all these things are important, when it comes right down to it, Christmas is about family. We had a wonderful Christmas this year. The only thing that would have made it better was if all my siblings and I lived close enough to spend part of the holiday together. We all talked to each other on Christmas day and we did get to see one of my brothers and his family for a couple hours after Christmas. So we did get to share a little bit of Christmas together even if most of it was via the telephone. 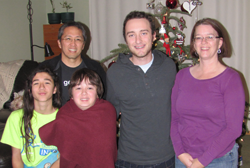 The best part of Christmas for my wife and I was that we had all our children with us for Christmas. We had a great time just being with the three boys. Thing 1 came home from California and hung around most of the time he was here. He only visited friends for a couple days, but other than that, he spent time with family. We had a marvelous time together. The five of us played games until all hours of the night on several occasions. We played new games and old including Monopoly City, Fortune Street, Scrabble, Dicecapades, Skip Bo, Scattergories, and Tripoley. The boys and I also had a fun time beating each others’ heads in playing Mortal Combat vs. DC Universe. Of course, the games were merely the bonus. The best part of it all was that we spent lots of time together. Another part of the reason Christmas was so amazing was because we did not need to twist Thing 1’s arm to get him to spend all that time together. In fact, he was even more than willing to go to church. Twice. We went on Sunday for normal service and Monday for Christmas Eve service. We did not need to coerce him and he did not drag his feet like he used to. He was a pleasant young man to be around. He enjoyed church and he was enthusiastic about playing the games and just being together. He was the happiest I have seen him in a few years. Which of course, made me happy too. Holidays and holy days are meant to be spent with family. To be sure, we need to remember the reasons for the seasons, but when our priorities are in line, the most important thing is family. We had an amazing Christmas this year because we got to spend time with our family. That’s more than sesbnlie! That’s a great post!